The crystal ball gives you access to the Shadowguard rooms. The Shadowguard is a series of encounters found at Minax's fortress in the Valley of Eodon. A single player or party can attempt to defeat the challenge. There are five rooms which have special conditions to complete. Double-click the enchanting crystal ball in the grand hall to open the rooms gump. It shows your current progress and allows the selection of encounters. The Shadowguard rooms are designed like puzzles. You may wish to figure out one or more rooms on your own. If you get stuck you can always read further into this article. There are five themed rooms that can be completed in any order. Red room names indicate you need to complete them. Green room names indicate a room that has been successfully completed. You can repeat successfully completed rooms as many times as you wish, but it won't net you anything. All five rooms must be completed before the roof can be challenged. To enter as a group you must form a Party. Only the party leader can use the crystal ball and select which encounter you will go to. Room difficulty is increased (more monsters) with the more party members you have. Once you enter a room, there is a 30 minute time limit to successfully complete the room (does not apply to the Roof). When the time limit is reached, all players in the room will be teleported back to the fortress near the crystal ball. You will also be teleported out if your entire party dies. There is an Ankh located next to the exit location that can be used to resurrect after a failed encounter. If for any reason you wish to exit a room without completing it, open a Contextual menu on your character and click 'Exit Shadowguard'. A rowdy bar filled with deadly pirates. You are transported into a bar with tables and ale left all over. Four waves of pirates will spawn. They have they same reflect damage as Executioners. You can fight them normally but there is also bottles of liquor that spawn on the tables. Place a bottle in your backpack and double-click to throw them at the pirates. If a throw is successful it does 300 damage. Four bottles will defeat a normal pirate. There is a chance to drink the bottle or have it break in your hand and damage yourself. The bottles randomly respawn and have a Lifespan of 60 seconds. After the normal pirates are defeated, Shanty the Pirate will appear. While he is stronger and faster than the initial spawn, he does not reflect attacks. The bottles of ale can still be used on him. Word of Death will not be reflected back on you, but only if the enemy health is 32% or less. A tranquil orchard until you start picking apples. "I've finally found... this vile orchard is the key to Minax's enchantments!... days I've spent trapped within this tower, I dare not pick the fruit from the foliage for I know not the consequences may... Hunger is building... so hungry I must... Blech! Vile fruit!... What's This? For when I tossed this vile apple from whence it came a horrific beast appeared!... for I hope I can fight it..."
Success - Your throw releases powerful magics and destroys the tree! Both the tree you picked the apple from and the one it was thrown at are destroyed. Failure - Your throw seems to have summoned an ambush! A Vile Treefellow will appear for every person in the orchard. This also occurs if the apple expires (they have a lifespan of 30 seconds). Use a scrap of paper to write down the type of apple each tree gives you. This will result in knowing exactly where each opposing tree is very quickly. 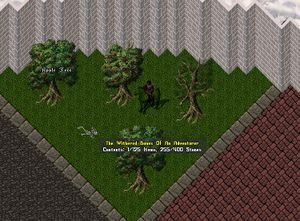 Do not attack the treefolk in any way (including summons). Doing so will drag you to them repeatedly and slow your progress. They move slow enough to avoid. Restless warrior spirits inhabit this area. The rooms and halls here are lined with armored statues. After a few moments Ensorcelled Armor warriors wielding Halberds will begin appearing inside the rooms. Most times when an armored warrior is defeated, it will drop a black bottle on the ground named a Corrupt Phylactery with a lifetime of 60 seconds. Pick up the bottle and take it to the center of the halls with the braziers that have special Purifying Flames. Double-click the bottle and target the flames. You will now have a Purified Phylactery in your backpack. Go up to one of the golden Cursed Suit of Armor statues, double-click the purified bottle and target the statue (easiest to target the statue base). The statue will be destroyed. Do this to all the golden statues to complete the encounter. Have one person handle the statues while the rest kill the warriors. 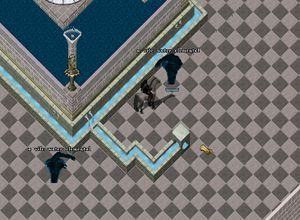 Have the party move to the next room once all the statues are destroyed in the current one. Someone needs to call a plumber. This grand fountain needs to be drained, it is overflowing and creating Vile Water Elementals. When killed they leave behind Canal pieces of various shapes on the ground. The goal is to create a canal between the four gold Spigots on the fountain and the drains scattered throughout the room. Place them in such a way as to create a way for water to flow from the spigot to the drain. Once you have a complete pathway double-click on the spigot to start the water flow. If the path is not correct then a Hurricane Elemental will spawn. Even worse, any parts of the canal that the water flowed through will be destroyed! Make sure you have a complete path for the water to follow before turning the spigot on. Once all four spigots are emptying into drains, the fountain will run out of water and the room is completed. More than one spigot can diverted into the same drain. Short on straight pieces? Create a zig-zag pattern with corner pieces. While the elementals are weak, they can quickly overwhelm you if they are not defeated quickly. Bring extra backpacks or pouches to easily organize all the canal pieces. Canal pieces will cover the entire floor and block your movement. Pick them up as quickly as possible. You must figure out how to reach the Greater Dragon. The first thing you will notice is the Greater Dragon perched atop the center platform. Beware, as it will breathe fire and cast spells down on you. There are a pair of Feeding Bells on both the west and east ends of the area. Double-clicking a Feeding Bell will summon Vile Drakes. When killed there is a chance that a Magic Drake Wing can appear on their corpse. Using this item a single player can be transported up to the platform to fight the Greater Dragon. The wing only has a lifespan of 1 minute so it is not possible to stock up on them and have everyone go at the same time. The Greater Dragon of this area is no ordinary Greater Dragon, as it has around 10,000 hit points. Periodically during the fight the dragon will randomly push a target (player, pet or summon) off the ledge. If this happens to a player they will need to find another drake wing to use. Melee warriors should be given the Magic Drake Wing first so they can begin their attack. Be sure to bring Dragon Slayer weapons and instruments. While tricky, Mystics and Mages can cast summons to the edge of the ledge. They can also discord and heal players from the ground. It is also possible for Tamers to guide their dragons up to the ledge without using a wing. The trick is to stop the dragon at the southeast corner, then run to the northwest corner and call for it several times. The dragon's natural flight ability will force it up to the ledge. Commanding it to stay and attack is crucial and sometimes difficult. Once all five rooms have been successfully completed The Roof can be entered. The final encounter is a large open room with a small balcony in the center. The enchantress Minax stands here next to a corrupted time gate which is used to summon her four lieutenants to battle. While she will taunt and target nearby players, she cannot be harmed and does not participate in the fight. 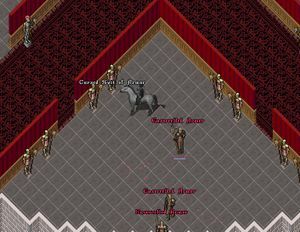 Upon arrival, each party member will see some taunting by Minax before she announces which lieutenant is summoned to fight first. 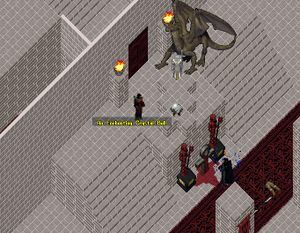 The chosen order of the four is completely random and all four must be killed for the encounter to be considered successful. Remember, there is no time limit during this final battle. After the final lieutenant is defeated, Minax will curse you as the time gate explodes, vowing her revenge to another day. A gold explosion will happen, similar to a champ spawn - as well a large amount of high level items that drop on the fourth boss' corpse. Keep in mind, you only have 5 minutes to loot the boss and gather gold! 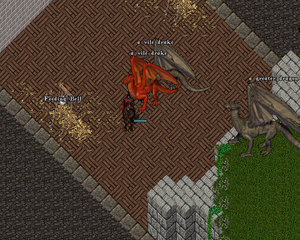 A group of tamers can finish the entire fight rather quickly, as the legends do not summon helpers on greater dragons. This tactic only works if you do not cast any offensive spells (including summons) or attack them directly. While Virtuebane cannot be discorded, the other three can. Do not attack Anon when he turns into an elemental, as he uses this form to rapidly heal. 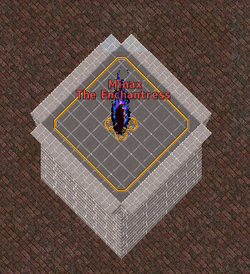 Avoid fighting near Minax, as her targeting will sometimes draw the attention of pets and summons. A player has the chance to receive one of the following artifacts in their backpack upon the death of the final legend of the roof encounter.